A Quick Guide to Relationship-Based Care is a 68-page booklet outlining the basics of Relationship-Based Care. This valuable resource is ideal for orientation of the entire workforce in organizations implementing Relationship-Based Care. Written in easy-to-understand language, this book will help everyone in the organization (especially those in later implementation waves) to understand that they are truly part of something meaningful. 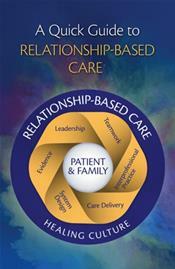 This book will be a game changer for all organizations implementing Relationship-Based Care!